The UC Cooperative Extension is conducting a three-year study of irrigation water use by vineyards in the Paso Robles area. This project is funded in part by a donation from the Paso Robles Wine Country Alliance. 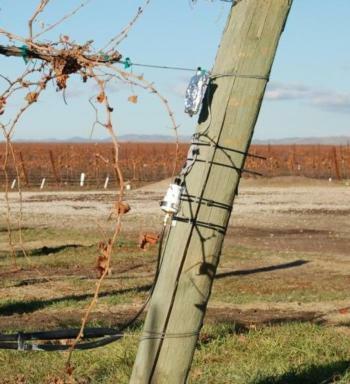 The purpose of this study is to quantify the irrigation water use by vineyards in the region which was earlier designated as the “Estrella-Creston Area of Concern,” where significant declines in the groundwater level have been observed in the past decade. A wide range of users rely upon the Paso Robles Groundwater Basin as their primary water supply, and all users have a vested interest in the sustainable productivity of this groundwater resource. This project will supply needed information on the average amount of water used per year in the area vineyards, as well as the variability of this use from year to year. The information will also serve as an important benchmark to allow irrigation users in the area compare their own water management practices to what the industry norm is in the region, and will have a valuable educational function by providing robust information on how and when irrigation water is used. At 84 randomly selected vineyard sites of cooperating growers, automated irrigation monitoring equipment was installed in late 2009. The equipment monitors both the drip irrigation systems, as well as sprinkler systems if present. Seven rain gauges are also located throughout the study area. After the third season of measurements in 2012, the summary water use information will be presented to industry and the public. Additional measurements have also been taken at the 84 study sites which will improve irrigation management information. In 2010, the irrigation crop coefficients were estimated at all locations by using the “Paso Panel” measurement method; this work was funded by a grant from the American Vineyard Foundation.